The mobile technology industry grows by leaps and bounds. By the second quarter of 2018, 51.89 percent of global internet traffic originated from mobile devices, such as smartphones and tablets. The statistics get better. By the end of July 2018, Global population of internet users stands at 4.1 billion, 3.3 billion of which are social media users. The statistics show that your audience is on social media, but you may wonder how you can generate leads from mobile and social media platforms. 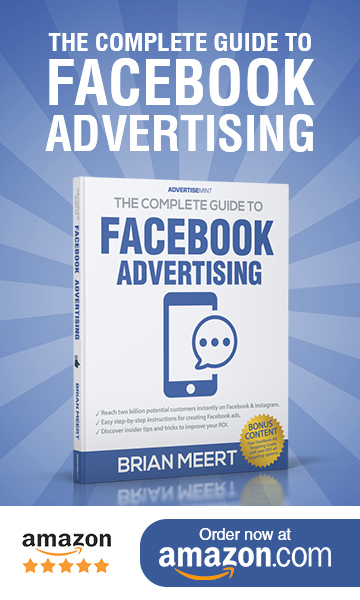 Here, you will learn how to use three social media ads to generate more leads for your business. Facebook has a huge potential for lead generation. As of Q2 2018, Facebook monthly active users (MAUs) stand at 2.23 billion. 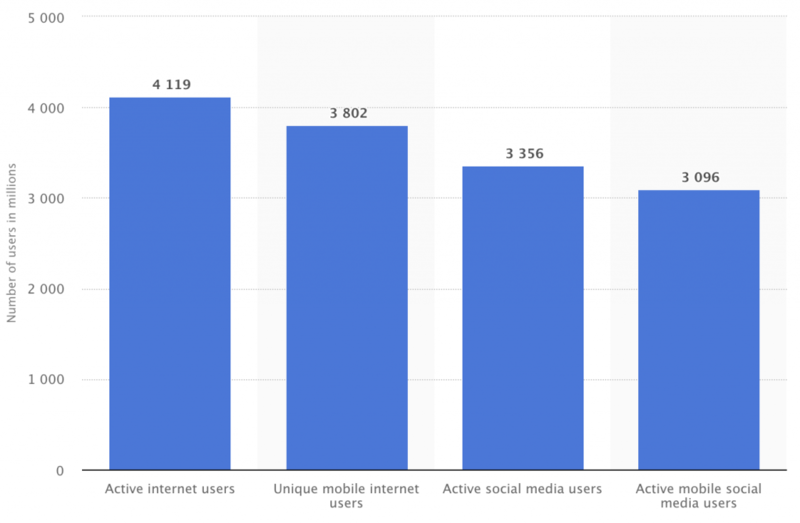 Out of this population, 1.74 are mobile monthly active users (MAUs). Additionally, 53 percent (more than half) of United States residents severally use Facebook in a day. Of all the social media platforms, Facebook is the most preferred by marketers, according to research by Statista. With Facebook’s popularity among users combined with its Lead Generation ad, you can easily collect inexpensive leads from Facebook’s platform. 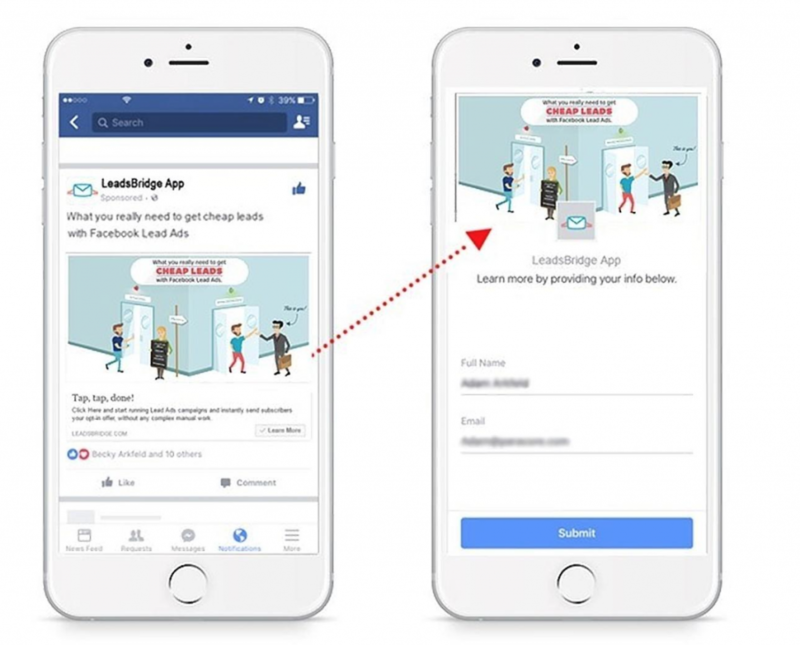 Here’s how the ad works: Facebook will show your ad, which you can create in Ads Manager using the lead generation objective, to users on their mobile devices. When users click on the ad, they will see a pre-filled form containing their information, such as name and email, acquired from their Facebook profiles. Users can instantly become leads by clicking the submit button, no extra steps necessary. The user does not have to the fill information manually, increasing the user’s likelihood of finishing the form and converting. All activity takes place on the Facebook platform—users won’t be redirected to a slow-loading website not optimized for mobile, increasing their likelihood of converting. You can store your leads in Business Manager and download the CSV file when needed. You can later use your leads for ad targeting. Facebook’s Instant Articles is a mobile publishing platform that allows you to share your articles and blogs to Facebook users. Articles published through Instant Articles load 10 times faster than a normal mobile web article. They also receive 20 percent more clicks and a higher number of reads. Other than creating a mobile-friendly article for Facebook users, you can also use the Instant Articles platform to generate leads. You simply need to use Instant Articles’ CTA units. When users click on an article from Facebook, the article will open within the Facebook app. As users read the article, they will spot a CTA button that encourages them to take a desired action. To acquire leads, you can use the Sign Up button, which allows users to seamlessly sign up for your newsletter. Step 1: Sign up for Instant Articles on Facebook and fill the required information. Step 3: Choose the articles you want to import to Facebook and convert them into Instant Articles. To do this, you can use the Instant Articles for WordPress plugin, the Instant Articles API, or the RSS Feed. Step 4: Connect your website to convert your articles. Go to “Configuration” in “Publishing tools” and click “Connect your site.” If you are using the WordPress plugin, add your URL. If you’re using the RSS feed or API, add a piece of code to the header of your website’s HTML. You are required to submit 10 articles for review and approval. Because only approved articles are published on the platform, make sure the articles comply with the instructions on the submission checklist. Step 5: Submit your articles for review. Click on “Configuration” and click “submit.” The review may take 3 to 5 business days. Once your articles have been approved, you can share them on your Facebook pages. To get better results, contact your leads as soon as they sign up. A welcome email is appropriate. The LinkedIn Lead Generation form helps you seamlessly collect quality leads from ads on LinkedIn with a pre-filled form. You can use the forms with sponsored InMail and sponsored content such as a link, image, or webpage update. LinkedIn Lead Gen forms come with pre-filled user information taken from users’ LinkedIn profiles. With the form, you can collect users’ professional information, such as place of work, position, and the field of study, in just a few clicks. With LinkedIn, 80 percent of engagements with sponsored content occur on mobile devices, and 57 percent of LinkedIn users visit using a mobile device. This makes the LinkedIn Lead Generation form an effective way of generating quality B2B leads for your business. If you’re not convinced, look at Bynder, a software company, that used the lead gen form to increase leads from sponsored content by 400 percent, achieving a 20 percent conversion rate. You can also use the form to track your campaigns’ cost per lead and the number of leads you are getting from a professional audience segment. You can download your leads from Campaign Manager or integrate with your favorite marketing automation or CRM tool. To optimize your Lead Gen Campaign for better results, make sure the images and copy are relevant, verify that your messaging matches your call to action, make your form concise, and do not include fields that require manual input. Evidently, mobile use is increasing. If you want to increase leads on social media, you have to ensure that your methods are optimized for mobile because your users will most likely access your lead forms using a smartphone or a tablet. To increase leads on social media, use Facebook’s Lead Ad, Instant Articles’ CTA button, and LinkedIn’s Lead Gen forms. Use one strategy at a time so you can more accurately measure performance. A social media advertising and marketing automation enthusiast, Stefan Des is the CEO and co-founder of LeadsBridge, a suite of automation tools for Facebook advertisers or for those working in a company for Facebook ads.